Welcome to AtoZEyewear.com - Authentic Designer Eyewear for less! Please choose one of the brands we carry. We Will Beat Any Competitors Price! Satisfaction guaranteed! Get A to Z Eyewear for less! 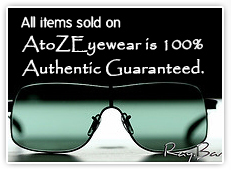 At AtoZEyewear.com we are dedicated to selling authentic designer sunglasses and eyeglasses at lowest prices possible. Our mantra is that everyone should enjoy such luxury brands as Prada, Gucci, Chanel, Oakley, Christian Dior, Tom Ford and many more, and we work very hard to make them affordable for an average consumer. We are able to achieve our goal of offering luxury designer eyewear at up to 50% off through careful evaluation of our sales channels. This is what makes AtoZEyewear.com one of the most popular destinations online for purchase of Authentic Designer Eyewear. All Merchandise sold on AtoZEyewear.com is brand new and 100% Authentic GUARANTEED. All sunglasses and eyeglasses come with complete retail package which includes case, cloth and paperwork. You may shop on AtoZEyewear.com with confidence, knowing you are in good hands. Customer Satisfaction is our #1 priority. We are here to make sure that you have an easy and hassle free shopping expderience and get the lowest price possible. Prior to shipping the order, we examine each frame carefully to make sure you get a flawless, high quality item that you paid your hard earned money for and that will last you for a very long time.